This package consists of a number of tools that pertain to the analysis and exploration of statistical interactions in the context of regression. Some of these features, especially those that pertain to visualization, are not exactly impossible to do oneself but are tedious and error-prone when done “by hand.” Most things in interactions were once part of the jtools package and have been spun off to this package for clarity and simplicity. All of these are implemented in a consistent interface designed to be as simple as possible with tweaks and guts available to advanced users. GLMs, models from the survey package, and multilevel models from lme4 are fully supported as is visualization for Bayesian models from rstanaram and brms. For the moment, the package has just been submitted to CRAN and may not yet be available as you read this. If that is the case, please install from Github. 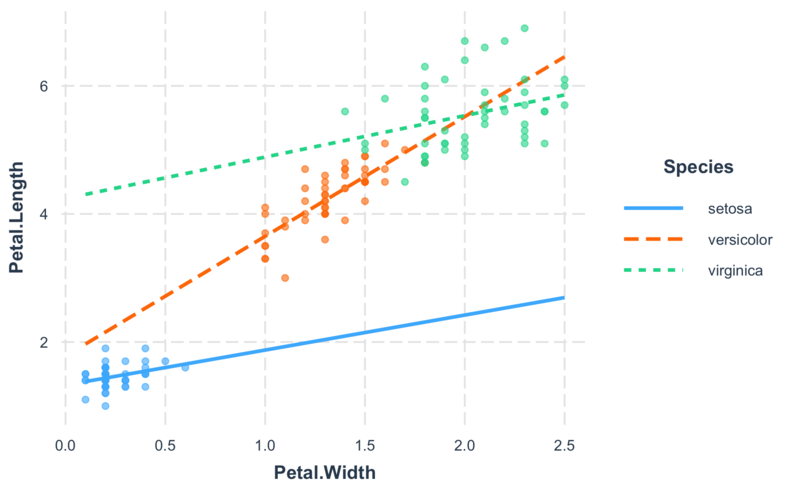 Unless you have a really keen eye and good familiarity with both the underlying mathematics and the scale of your variables, it can be very difficult to look at the output of regression model that includes an interaction and actually understand what the model is telling you. This package contains several means of aiding understanding and doing statistical inference with interactions. The “classic” way of probing an interaction effect is to calculate the slope of the focal predictor at different values of the moderator. When the moderator is binary, this is especially informative—e.g., what is the slope for men vs. women? But you can also arbitrarily choose points for continuous moderators. With that said, the more statistically rigorous way to explore these effects is to find the Johnson-Neyman interval, which tells you the range of values of the moderator in which the slope of the predictor is significant vs. nonsignificant at a specified alpha level. The sim_slopes function will by default find the Johnson-Neyman interval and tell you the predictor’s slope at specified values of the moderator; by default either both values of binary predictors or the mean and the mean +/- one standard deviation for continuous moderators. 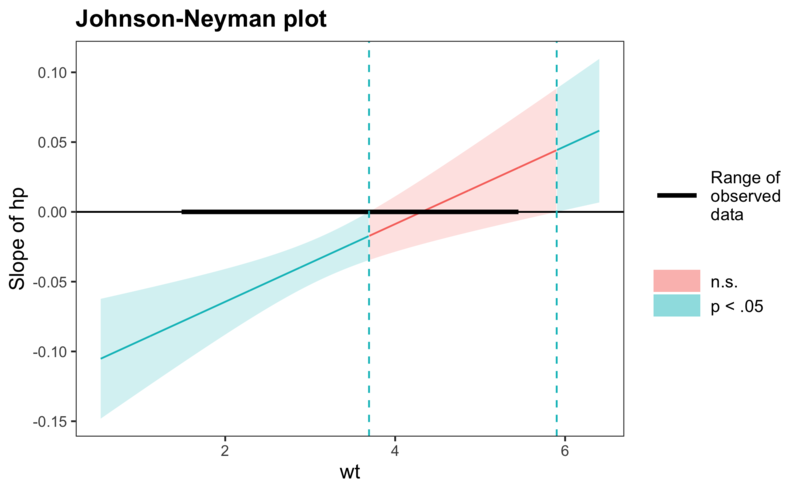 The Johnson-Neyman plot can really help you get a handle on what the interval is telling you, too. Note that you can look at the Johnson-Neyman interval directly with the johnson_neyman function. The above all generalize to three-way interactions, too. 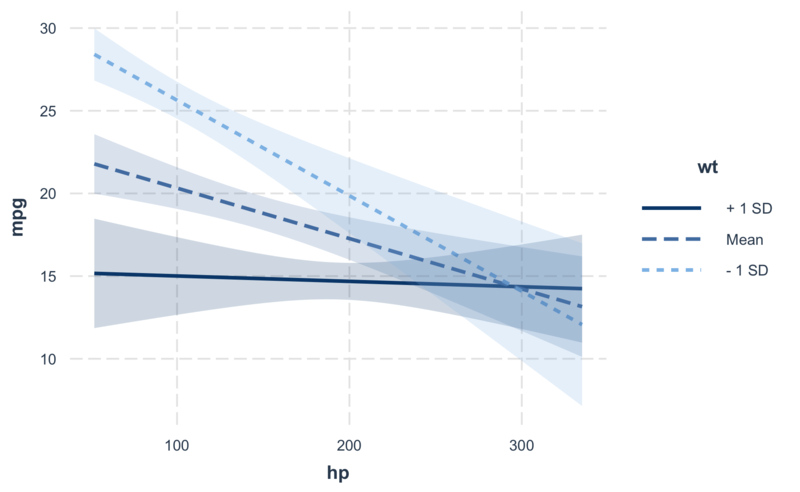 This function plots two- and three-way interactions using ggplot2 with a similar interface to the aforementioned sim_slopes function. Users can customize the appearance with familiar ggplot2 commands. It supports several customizations, like confidence intervals. 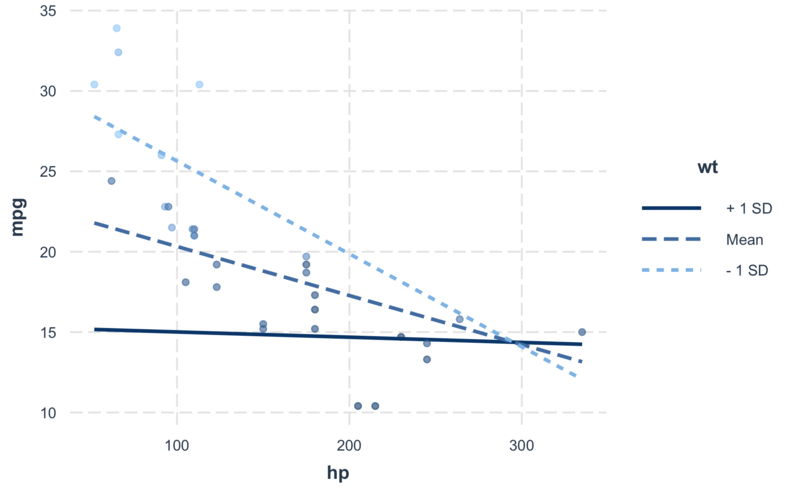 The function also supports categorical moderators—plotting observed data in these cases can reveal striking patterns. You may also combine the plotting and simple slopes functions by using probe_interaction, which calls both functions simultaneously. Categorical by categorical interactions can be investigated using the cat_plot function. I’m happy to receive bug reports, suggestions, questions, and (most of all) contributions to fix problems and add features. I prefer you use the Github issues system over trying to reach out to me in other ways. Pull requests for contributions are encouraged. Please note that this project is released with a Contributor Code of Conduct. By participating in this project you agree to abide by its terms. The source code of this package is licensed under the MIT License. Developed by Jacob A. Long. Site built with pkgdown 1.3.0.